If you’ve followed the career of The Butcher Brothers (Mitchell Altieri & Phil Flores) up until now, then you’ve no doubt come to expect the unexpected: Not content to ever play it safe, they have become polarizing directors in the horror community. The less said about the April Fool’s Day (2008) remake the better; but it is the better than the boring original (sorry purists) at least. However, 2006’s The Hamilton’s was a critical success; by incorporating dysfunctional family and coming-of-age melodrama with a fresh take on vampire mythology, they certainly made a statement. Their next feature, The Violent Kind (2010), pushed the envelope even further by splashing splurges of crime, horror, sci-fi, drama, surrealism and comedy on the canvas to create a polarising genre-bending masterpiece that just needs to be seen to be believed. Love them or hate them, you can’t fault their ambition, and Holy Ghost People is another change in direction. Holy Ghost People is a wonderful Southern Gothic suspense thriller that explores the concept of faith and religion: on one level, religion is portrayed as being a dangerous tool that breeds fanatics; but, it also explores religions ability to heal those who suffer from addiction, social rejection and sickness. In the movie we’re introduced to two lost souls: Charlotte (Emma Greenwell) and Wayne (Brendan McCarthy). Charlotte is on a mission to find her missing sister after receiving a letter informing her she was residing in a religious mountain community known as the Church of One Accord. She enlists the help of Wayne, an alcoholic ex-marine who’s struggling with demons of his own. The community is run by the charismatic Brother Billy (Joe Egender), a snake-handling preacher who isn’t shy of causing harm when necessary. However, Charlotte and Wayne’s search for Charlotte’s missing sister reveals some sinister truths about themselves, as well as the Church of One Accord. Holy Ghost People lies somewhere between The Sacrament (2013) and Martha Marcy May Marlene (2011); but it stands out on its own is by having more conflicted, fleshed out characters. Furthermore, while criticising the stronghold religion can have in the form of extremity, it does not negate its power to comfort those in need: Charlotte and Wayne go into the community as 2 people in need of help and guidance, and one can’t help but think they might have found it there if they allowed themselves to be a part of it. However, the community is very much still a cult who are prepared to die and kill for their extreme viewpoints. Did I mention that this movie is conflicting already? This is the most cohesive Butcher Brother’s movie to-date: Unlike their previous efforts which shift gear more than the Fast & Furious franchise. 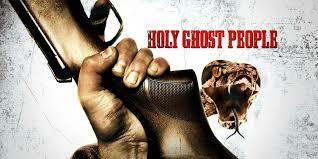 Holy Ghost People is a formulaic thriller. But the performances from the actors and thought provoking content lift it beyond the populated realm of generic action/suspense capers. The cinematography just happens to be exquisite, boasting the mountains, rivers, roads and landscapes of Tennessee with texture and aplomb. It also provides a fitting backdrop to the hopelessness and desolation of the characters by placing them in an isolated environment away from the regular society that’s shunned them. Holy Ghost People is an outstanding thriller which questions universal views on faith and religion, as well as exploring human themes such as addiction and alienation. There’s enough thrills and chills in store for a casual adrenaline rush, but beyond the surface is a smart, intelligent movie that will leave a lasting impression if you let yourself invest in the characters demons.